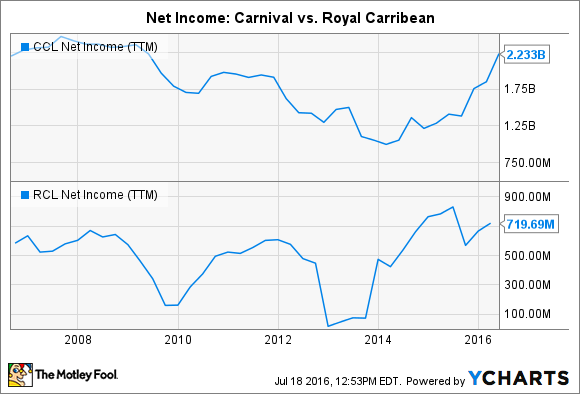 Is Carnival Cruise Stock a Buy? Why pessimism around the travel industry could spell opportunity for long-term investors. Unlike its vacation packages, Carnival Corp's (NYSE:CCL) stock is getting cheaper these days. Shares are down by 12% over the last 12 months, and while that's a better performance than what rival cruise line Royal Caribbean (NYSE:RCL) turned in, it still significantly lags the broader market. Meanwhile, Carnival's operations are improving and shareholders have good reason to expect record results this year. The gap between the trends in the stock and in the business could make shares a solid buy for long-term investors. Start with the fact that fiscal 2016 is shaping up to be a banner operating year. Net revenue per passenger-day improved by 4% last quarter, following a 6% jump in the prior quarter. Package bookings are also trending higher, both in terms of volume and average prices, which points to healthy demand for cruises. Overall, the company is performing ahead of management's projections. While boosting his full-year profit forecast, CEO Arnold Donald told investors in June that Carnival's "strong second quarter demonstrates continued momentum as we again achieved a near doubling of adjusted earnings per share." Two key challenges are offsetting some of those hefty demand gains. Foreign currency swings are pressuring reported results, for one. Carnival's average ticket revenue is up by less than 1% over the last six months, but would be up by 2.1% if it weren't for exchange rate issues. Rising fuel prices are also producing a drag on earnings growth -- though Carnival has limited the gas price impact through its fuel hedging program. Carnival's finances are improving despite those issues. Its operating margin has spiked to 18% of sales over the past six months, compared to Royal Caribbean's 11%, which helped the cruise line produce $750 million of net income, or almost triple its bottom-line from the comparable period in 2015. Profits are up above $2 billion per year and nearly at the record-high level Carnival reached just before the 2008-2009 recession. CCL Net Income (TTM) data by YCharts. Earnings can be volatile in the cruise ship business, though, which is why investors should also keep an eye on cash flow. Carnival's free cash generation is up a healthy 17% so far this year, to $2.7 billion. That has helped fund a big increase in capital expenditures (ship upgrades and fleet growth) while leaving plenty of excess cash for additional returns to shareholders. Carnival recently boosted its dividend by 17% and the stock now yields 3%, compared to Royal Caribbean's 2.1%. The leisure travel industry is sensitive to weakening economic growth. Vacation packages are among the first spending category that people cut out when they're in money-saving mode. 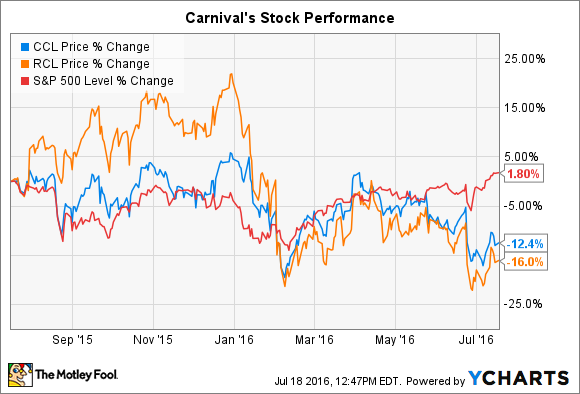 That's why expectations for slowing global growth likely play a big role in the decline in Carnival's stock price lately. But investors with a longer time horizon can look past this short-term challenge. Regardless of how the industry performs in the next year or so, Carnival can use its dominant market position (it accounted for nearly 50% of all cruise guests last year) to capture more than its fair share of industry growth. Meanwhile, the stock is valued at a nearly five-year low in relation to earnings. Investors can buy the cruise operator for just 16 times trailing earnings, putting it at a discount not only to the broader stock market but also to less-profitable Royal Caribbean. In my view, that's a good deal for a company that's expected to boost profits by 20% this year as its return on invested capital reaches an all-time high of 9%.